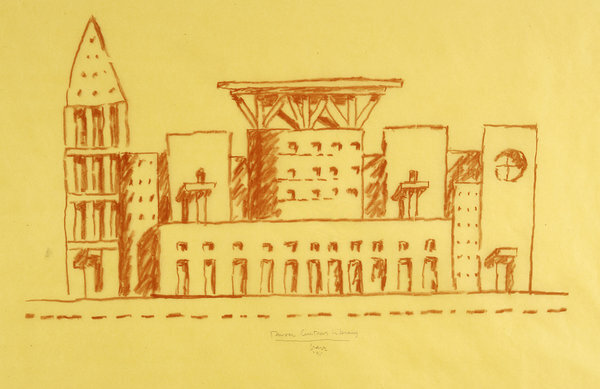 In Last week’s Sunday Review the New York Times published an opinion piece by design polymath Michael Graves, making public a discussion that has been ongoing in design circles for some years now: The Death of drawing and what it means to the design profession. With the pervasiveness of digital technology is drawing by hand becoming a marginalized skill and a dying art? Graves speaks mostly from an architectural perspective and references his own growth as a practitioner as well as noting the need for digital and computation but lamenting a perceived lack of emotion in those designs. At Yeh IDeology, this question is a daily conversation that we have with our clients. The visual nature of design makes hand drawing still an attractive piece of a portfolio and one that very quickly and easily shows process and how a designer, young or old, thinks. Yet without the ability to translate those drawings into 3D some of that value is lost and extends the design process unnecessarily. The ideal designer combines a solid foundation of hand drawing skills with the ability to translate and iterate quickly in 3D. Where do you stand on this debate? Is Hand Sketching that important to your practice? Are tablets the right kind of in between system? And what does the future hold as technologies get faster and cheaper in this domain? Read Graves' opinion piece here and tell us how you feel. PepsiCo made a really great move this past week by introducing Mauro Porcini as their first Chief Design Officer.This is a major win for PepsiCo and particularly their brand culture, which has undergone a variety of shifts during its lifetime without a key design chief to steer the ship. For a great visionary leader in design such as Mauro Porcini to handle the design language and image of the corporation’s top brands, PepsiCo may finally be able to settle upon an image or stronger sense of brand equity. Longtime rival Coca-Cola has known this for a while, whether purposefully or by a lucky draw, which is why the color red and scripted font are unmistakable throughout the world. And in a world where the brand is sometimes worth more than the product itself, bringing someone in who finally has the ability to say "This is who we are, this is what we are about, and we need to scream it from the mountaintops" is exactly the thing they need, not another, newer logo to take place of the old one. It's just another example of companies that are beginning to trust design, understand its value, and seek it out, and let designers take the reigns and utilize their creativity to establish brands. As more companies begin to understand that design isn’t just about styling pretty things, that in reality it's a vehicle and an invitation for the entire consumer experience, the world will begin to see more and more impactful and engaging brand experiences and start to develop more personable relationships with the product. Recently, Facebook has been in the news for its highly anticipated, if poorly executed IPO, and to a lesser extent, the stealth marriage of its young CEO Mark Zuckerberg to his college sweetheart. Flying under the radar is COO Sheryl Sandberg’s commencement speech to Harvard Business School’s class of 2012.I finally took some time out today to listen to Sheryl Sandberg's address and I was so impressed that she gave such a great speech illustrating the science of Career Strategies in this new world economy. Among other topics, she ruminated on the breakdown of traditional methods in career pursuit, insightful views on being a truly successfully leader/manager, and the continuing gender inequality in the workplace. Below are some slightly paraphrased quotes that I thought really hit hard, and what I thought about them. If you have some free time, I definitely suggest taking a look at the video or transcript. On Career Strategies Sheryl gave some great advice on how to how careers work in today's society. Much of this is what I lecture about in my Careers Strategies Course and Workshops. As traditional structures are breaking down, leadership has to evolve as well. From hierarchy to shared responsibility. From command and control to listening and guiding. Your strength will not come from some place on some org chart, Your strength will come from building trust and earning respect. You're going to need talent and skill and imagination and vision. More than anything else you're going to need to communicate more authentically, to speak so you inspire people around you, and to listen so you continue to learn each and everyday on the job. Hierarchical, rigid business structures are making way to flatter and more collaborative models, with clear, authentic communication and an open mind as must-have tools to succeed. We look for these attributes in all of the candidates we work with at all levels. Our more progressive clients know this as well and seek these attributes for their businesses. The work place is an especially difficult place for anyone to tell the truth. Because no matter how flat we want our organizations to be, all organizations have some form of hierarchy. And what that means is that one person's performance is assessed by someone else's perception. This is not a set up for honesty. Think about how people speak in a typical workforce. Truth is better used by using simple language... People rarely speak this clearly in the workforce or in life and as you get more senior, not only will people speak less clearly to you but they will overreact to the small things you say. Next time you hear something that’s really stupid, don’t adhere to it, fight it or ignore it, even if it’s coming from me or Mark [Mark Zuckerberg that is]. Individuals and businesses need to understand the structural barriers that inhibit proper communication, realize how it affects their interactions and adjust accordingly. When they realize this and put it into practice, not only do they garner respect, but they also lay the foundation for a successful future. A good leader recognizes that most people won’t feel comfortable challenging authority, so it falls upon authority to encourage them to question. It’s easy to say that you’re going to encourage feedback but it’s hard to do, because unfortunately it doesn’t always come in a format we want to hear. When you’re the leader, it is really hard to get good and honest feedback, no many how many times you ask for it. One trick I’ve discovered is that I try to speak really openly about the things I’m bad at, because that gives people permission to agree with me, which is a lot easier than pointing it out in the first place. To take one of many possible examples, when things are unresolved I can get a tad anxious... Ask yourself, how will you lead? Will you use simple and clear language? Will you seek out honesty? When you get honesty back, will you react with anger or with gratitude? As we strive to be more authentic in our communication, we should also strive to be more authentic in a broader sense. I talk a lot about bringing your whole self to work— something I believe in deeply. Creating a clear map of how you want to lead and what you want from those you lead helps set a standard by which you can be held. Moreover, learning how to foster and accept constructive criticism will make you a better leader (and person :) ). It's not often an easy thing to uphold but it's incredibly rewarding when you accomplish this. I practice this as well with my team running my business. Motivation comes from working on things we care about but it also comes from working with people we care about, and in order to care about someone, you have to know them. You have to know what they love and hate, what they feel, not just what they think. If you want to win hearts and minds, you have to lead with your heart as well as your mind. I don’t believe we have a professional self from Mondays through Fridays and a real self for the rest of the time. That kind of division probably never worked, but in today’s world, with a real voice, an authentic voice, it makes even less sense. I talk about my hopes and fears and ask people about theirs. I try to be myself. Honest about my strengths and weaknesses and I encourage others to do the same. It is all professional and it is all personal, all at the very same time. One major distinguishing characteristic of successful modern business from those in the past is the bridging of professional and personal lives. Learn what fundamentally drives the people your company and speak to those motivations then the company will drive itself. We need to start talking about how women underestimate their abilities compared to men. Success and likeability are negatively correlated. That means that as a woman is more successful in your workplaces, she will be less liked. This means that women need a different form of management and mentorship, a different form of sponsorship and encouragement, and some protection, in some ways more than men. When they hear a woman is really great at her job but not liked, take a deep breath and ask why. We need to start talking openly about the flexibility all of us need to have both a job and a life. I’ve spent 20 years in the creative industry and observed that women in the field are not immune from the challenges their peers face in other industries. Keeping a level head in the face of adversity and openness in addressing the issue are small, but necessary steps in the direction. The professional world is in the midst of a revolution. The most successful job seekers adapt to the new environment. They focus primarily on skills and value they can add rather than superficial titles. They take risks joining companies that are challenging norms, pushing innovation and are less concerned with location and prestige. We all need to continue this revolution. At Yeh IDeology our day-to-day consists of matching design talent with companies that need that designers. However, that’s a fairly narrow way to think about design recruitment, and we like to keep the broader picture in mind. Every corporation that hires a new designer grows it’s design department. Each department that grows will reach more individuals with its thinking. And as more people appreciate and value quality design, it gains traction as a positive force not only improving the day-to-day, but also addressing social challenges. Humanitarian aid, much like design thinking, has undergone a substantial shift in recent years. Summed up by Project H’s creed “Design WITH, not FOR” there is now a heavy focus on collaborative long-term solutions. By integrating a system into an existing community, the effort becomes self-sustained and assists individuals not only in the immediate, but also in the long term to gain a greater autonomy and sense of control, addressing (at least in part) the harsh psychological effects of poverty. Design Impact is looking for a new set of fellows to carry on with the great work they have already accomplished. On January 1st they opened their call for the 2012 set of fellows, passionate, talented designers who want to work in the field and do hands-on work in India. Check out their website to see if you'd like to apply!